We have quite a bit of news to cover this August. We’re trying a new approach: you’ll be able to find all of our latest and greatest product news here on the Revinate blog. Check back each month for new product updates. We are very happy to announce the release of our new Satisfaction Reports for Revinate Surveys customers later this week. These new reports mark the first release targeted at giving hoteliers deep guest satisfaction survey results to support better decision making, higher performing operations, and happier guests. 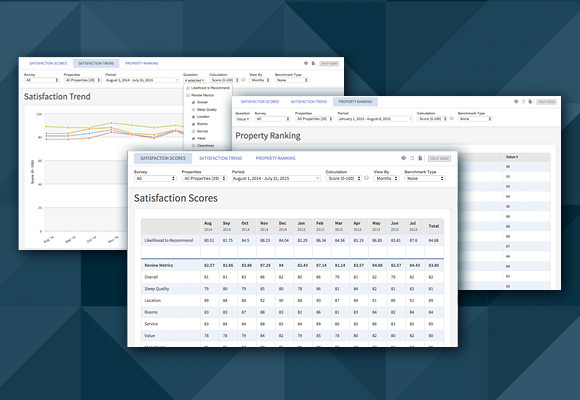 This reporting suite is comprised of three report types: Satisfaction Scores, Satisfaction Trend, and Property Ranking. The Satisfaction Scores report displays the results of all the survey questions, for the most data-centric analysis of satisfaction data. This report offers a bird’s eye view of your results to easily spot anomalies and trends, and a deep dive into these anomalies to understand the key drivers of your guest satisfaction. The Satisfaction Trend report is perfect for visualizing the evolution of metrics over time and correlating different metrics. For example, you can display your Wifi Scores and Overall Satisfaction scores side by side, which will help you understand how closely correlated these two scores are. If they were highly correlated, improving the Wifi would likely have a huge impact on your overall guest satisfaction. The Property Ranking report (corporate users only), allows you to better understand how your properties stack up against each other on any result of your survey program—whether it be Check-In Efficiency, Net Promoter Score or % of Problem Resolution. Leverage your best performing properties for best practices and improvement ideas to share with the lowest performing properties. These reports are built on a common, powerful reporting foundation, allowing us to extend them with Calculations, Topic Scores, Filters, and Benchmarking. Our Calculations now include a 0-100 score so you can see a single, normalized score regardless of your question type. We are also introducing Topic Scores which allow you to represent a set of questions, related to housekeeping for example, with a single score. Topic scores are extremely valuable to help you track the performance of departments in your hotel. These new reports offer a wealth of ways to look at your Revinate Surveys data and get insights into your guest satisfaction. They will go live for all Revinate Surveys customers later this week. Stay tuned for in-app support and please reach out to support@revinate.com with any questions. If you’re not currently a Revinate Surveys customer and would like to see a demo, CLICK HERE to get in touch with us. Check back next month for more Revinate product updates! Can you schedule a Webinar were you can show us how to use and view the new reports? You can access the new reports under the Surveys > Satisfaction Reports tab when they go live later this week. We have some help desk articles on this subject for Revinate customers. Feel free to read more about how to access and use the reports on the help desk for now. We will continue to gauge interest about a potential webinar. And of course, our world-class support is available to Revinate customers. Email support@revinate.com if you need more help. Is there any plans to provide a ‘during-stay’ survey function to allow hotels to get real time feedback whilst guests are still on the property? This will allow hotels to fix problems before they leave which will inevitably lead to better reviews and satisfaction.